Colesberg lies along that section of the N1 highway that belongs to typical little Northern Cape towns like Hanover, Bethulie, Springfontein, De Aar and Trompsburg. It’s the part of the highway where I begin to nod off if not driving, and to daydream if I am. It’s the section of the N1 that tends to pass in a blur, somewhere en route to the halfway mark of the central Karoo and Beaufort West. But Colesbergers think their town worthy of a stop. Their tourist brochures and documents speak about ‘having arrived’ when you are in Colesberg. ‘All roads lead to Colesberg’ they say, as the town considers itself the centre of South Africa; the epitomy of true Karoo hospitality where the N1 meets the N9. Colesberg also claims to be the largest Northern Cape town on the N1. Not difficult if you consider the other contenders. We can’t resist a peek. We’re on the road from Bloem to Richmond, which means we have time to kill (or so we think, until we later discover that the book town of Richmond needs far more than a day to do it justice). I discover that Coleskop, which towers over the town, used to be called Toverberg (magic mountain) because despite advancing on the mountain it seems to get no closer to you (something of a conundrum). And that Colesberg is named after a Sir Lowry Cole, governor of the Cape of Good Hope between 1828 and 1833 (not essential information, it is true, but good to know when you’re asked if it’s named after Coleskop, and you mutter ‘yes’). Colesberg has what I perceive as a ‘false’ entry from the N1. The initial part of Sluiter Street does not look like much. If it is simply a bed for the night that you are after, you may venture no further than the run of motel-style lodges that greet you just off the highway, and you will miss the essence of town. 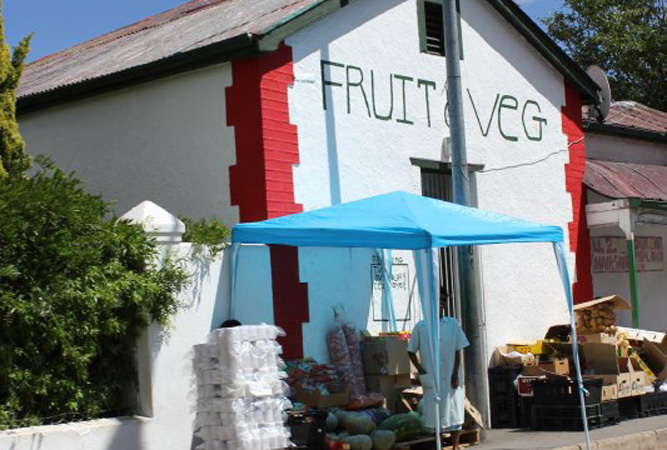 Drive a little further along Sluiter Street to what looks like the end of it, where it takes a left swing into Ventershoek Street and you will head towards the heart of Colesberg. The locals are proud of their town, its historical significance, the walks they have devised for visitors and their notably on-the-ball and friendly tourism information office, which shares its space with the Colesberg Kemper Museum – the building is one of several national monuments, built in 1861. 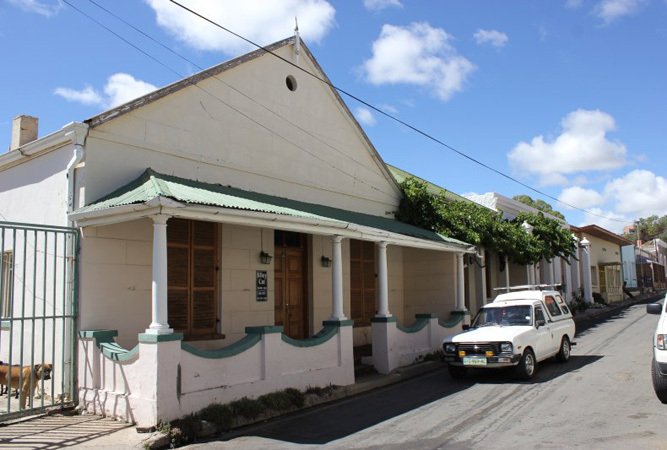 The first building I notice is just as we round the corner into town, way before we find the information office, and one you can easily miss, as by then your sights are set on the Dutch Reformed church ahead of you. 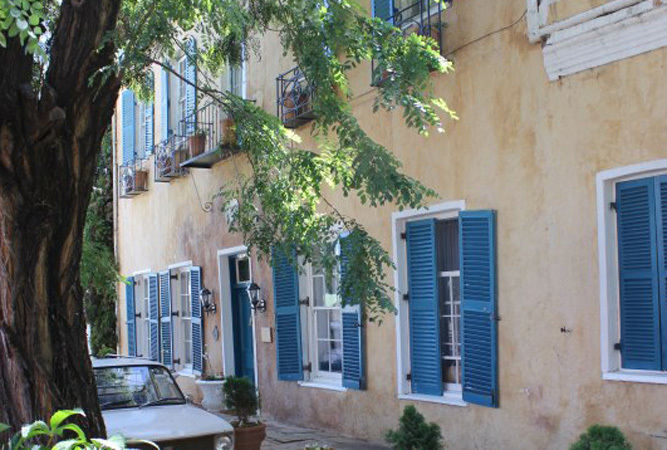 Coniston House rests on the bend of Ventershoek Street, the shuttered windows of its Cape Georgian house painted blue and hidden in the shade of several old trees. I nod to the gardener busy pruning trees. He’s the only one around, but he’s not averse to a few words of conversation. ‘It’s a guest house,’ he mutters, inbetween clipping bits of lemon tree. But that is all he’s willing to reveal. Used as a hospital by the Boer forces during their occupation of the district during the Anglo-Boer War the house is also famous as the site where President Kruger and Lord Lock discussed the Swaziland issue. History aside, it’s a beautiful house that catches my imagination. 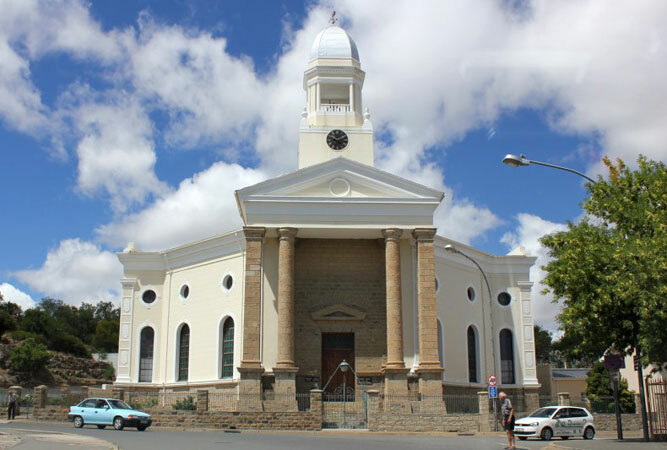 At the crest of Church Street stands the Dutch Reformed Church, its unusual octagonal shape across the road from a wrought iron lamp placed there to commemorate Queen Victoria’s 60th Jubilee – people have their pictures taken here; here and at the Colesberg Sloot. In front of the information office is an old-fashioned cobbled square in which several police cars are stationed, their office to one side of the square. And a pink house on the square. It all reminds me a little of the squares in Europe. Colesberg has devised the Time Traveller’s ‘walk about’ route map, which you can pick up at the information office. The pull-out map provides a series of pictures, corresponding numbers and places on the map that take you right around town – best done first thing in the morning, or late afternoon during summer as it gets pretty warm. 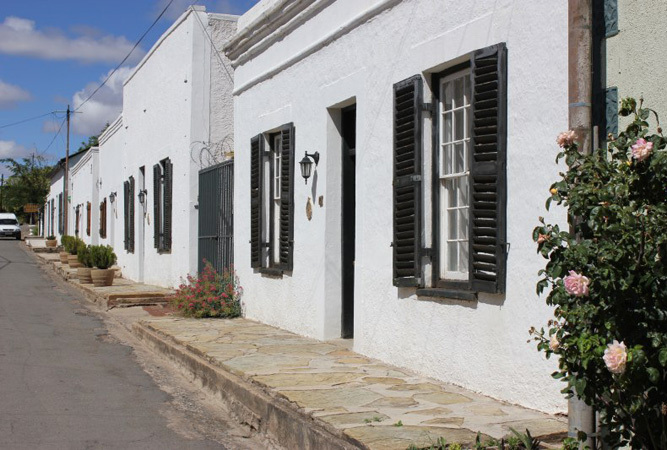 Town is fraught with wonderful examples of little Karoo houses, many of them in D’Urban Row, parallel to Church Street, their little verandas and cornices carefully restored, whilst you will find other examples in Bell and Murray Streets. But Colesberg is not all about its historical buildings. On the contrary, the information bureau has put together another walking route of about four hours known as the Struggle Route (starts at the information office and continues through Kuyasa), a 5 km hiking trail on the outskirts of town, a mountain bike trail in the Skietberg, and a family and dog trail. We stayed at Coniston House last year. The lady who owns it is a mine of information and it is worthwhile to stay over there even if it’s just to hear her stories. I do hope that they can ban the big trucks driving into the town though. Thank you, I will defiantly do this when we go down to Cape Town again.